Need Help choosing the fit you want? Click on the boxes below to choose the products you wish to purchase for your boat. Custom Covers are fit specifically for the Year, Make, Model, and Features of your boat. Fully trailerable, custom covers offer the BEST protection for your boat. Available in 2 fabrics & 14 colors. Semi-Custom covers are fit for the average hull type in one foot increments. Your boat may differ slightly. 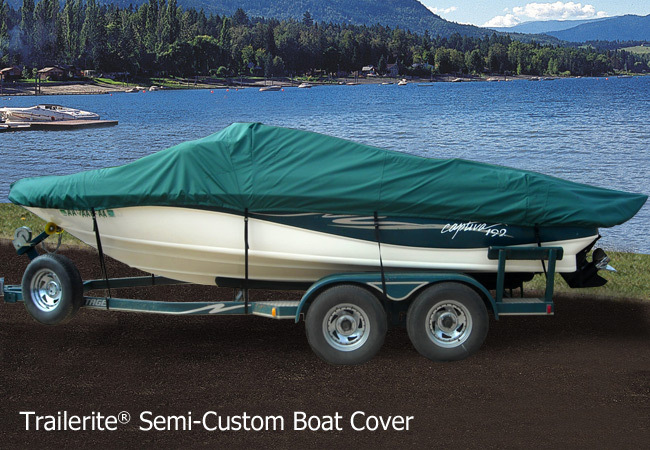 Fully trailerable, custom covers offer better protection for your boat. Available in Hot ShotTM fabric and 7 colors. BoatGuard® covers are America's best selling universal-fit trailerable boat covers. Strong enough to be trailered, and are fully capable of surviving the rigors of the road. Made from 6.25 oz. polyester fabric in grey. BoatGuard® Eclipse universal fit cover is designed to be eye catching and fully trailerable. Available in Hot ShotTM fabric. Unique design spreads strap tension evenly across cover surface. Bimini BoaTops® provide lots of refreshing shade while affording you visibility over your windshield instead of just through it. Sold with the Frame & Fabric Tops packaged separately.